These low-heeled men’s shoes were likely made in Haverhill, Massachusetts by the wearer, Leonard Phillips, in the early years of the 19th century. They are in the Buttonwoods Museum collection (Haverhill, MA. http://www.haverhillhistory.org). There is no question that these are a rare survival as well as a very personal response to the shoemaker’s impending nuptials. The charming shoes are leather, embellished with leather appliques of animals, fish, peacocks & other birds, and trees. They convey a “folk” art feel. Given the attention paid to the soles, one wonders about the religious background of the couple – were the soles visible while kneeling for wedding rites or communion? 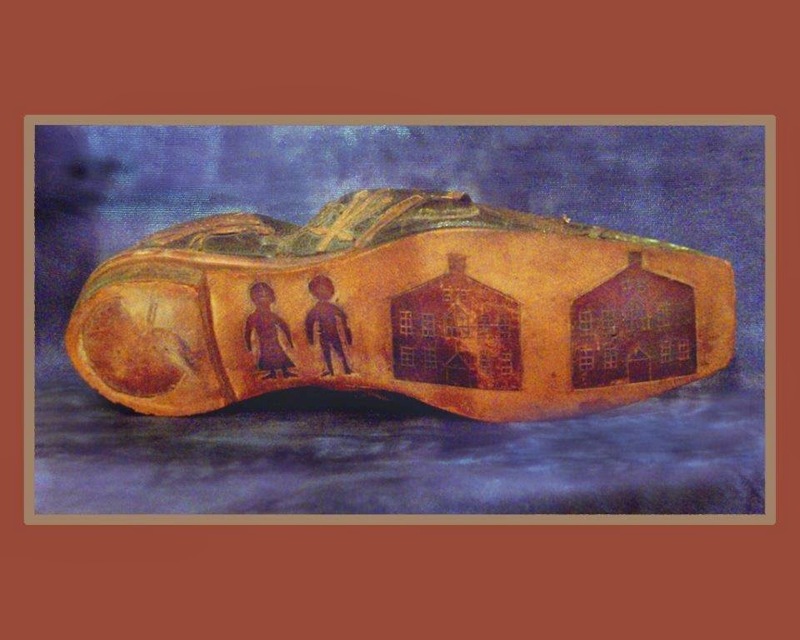 The soles are incised with a man and a woman between two houses and there is a peacock incised on the heel. The clarity of the image on the sole and the condition of the heel suggests very little wear – perhaps worn just on this single occasion. We are given a vision of the literal joining of the homes of the bride and groom in matrimony. Whether the ornament included on the shoes was part of a European tradition familiar to the maker, or his bride-to-be is not known at present. 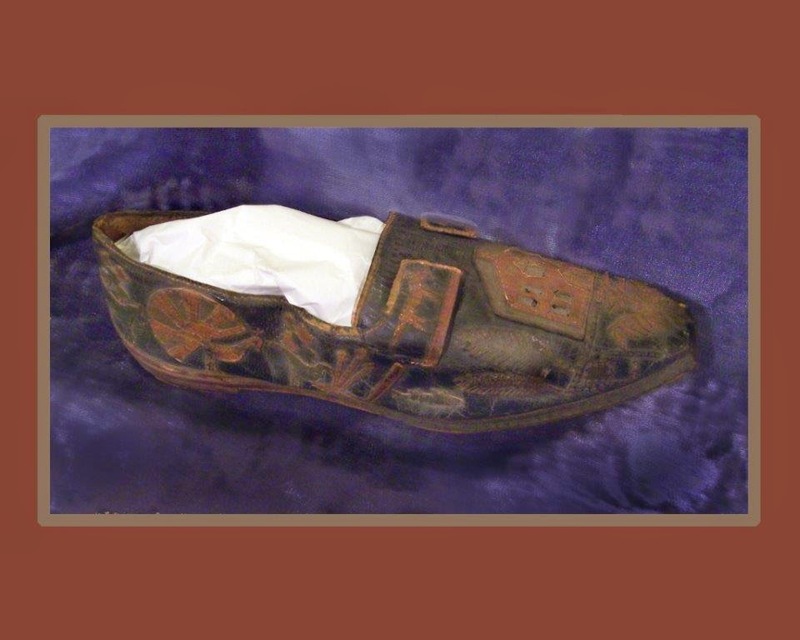 There are examples, such as these 19th century French wedding clogs (from the Musee rural des Arts populaires de Laduz, Yonne) which hold some similarity of purpose and motif, scattered in world-wide collections. Leonard Phillips married Sarah Head of Bradford, Massachusetts on January 20th 1819. The groom was 27 and the bride was 23. Oh, to be able to see the couple in their wedding clothes! "Leonard Phillips/ April 1792 - July 1832/Married Sally Head 1796 - 1881/Children/John Henry - 1820-1831/Sarah Almira 1823-1913/ Sarah married Charles Henry Brown - lived at 111 Keeley Street. Their son John Henry - our grandfather - hence Leonard Phillips maker of the shoes - our great, great grandfather - Beatrice & Rosalie Keene, Kathleen K. Babb"
Thank you to Jan Williams, Director of the Buttonwoods Museum, for her assistance.